I've never had such a day before, but this is amazing how a day can unfold. I have to admit $258 of it didn't come from my site, but it's from one of my Instagram accounts. I've built a Disney account that has over 106K followers and I finally closed a sponsorship deal yesterday for 2 posts on it. The rest did come from my website and I even made $45 from a product I HIGHLY did NOT recommend and they still bought it!! Grace you are the one to follow to make it in WA, I celebrate your success and I know if we keep putting in place everything that we have learned, we'll see what you are witnessing right now. Oh, I feel so happy for you because if we keep working hard that's what we can expect too. Congrats, you did it! Thanks very much Eugene! Indeed you could look forward to days like that too! Thank you, check out my latest results here too: Apr'18 Results: 358 Referrals Plus Many Milestones! That is awesome Grace! congratulations and I wish you endless more days just like this and better. I hope that some day I will be able to report something similar. Thanks for your well wishes and support!! That's awesome. You tell them not to buy and they hand you $45 on a plate anyway. That's great! I always love reading about your success Grace, you're such a great motivator. Appreciate this, thanks very much! Congratulations! I just had a look at your amazon store...it is lovely. I thought only Disney can sell their own products. Didn't know its possible to sell on their behalf. I’m sure you will achieve this too, just keep writing and using low hanging fruit keywords. Great stuff Grace, makes it all worthwhile when you see results like this. Thanks for sharing and congrats !!!! Congratulations. When you are on a roll, you are on a roll. This shows accomplishments come from unforeseen places. Enjoy! Awesome! Congrats. Keep it going! Congratulations, well done. Sweet Mickey page. Wow over 106.000 fans, how long does it take to get so many followers? You are going to have a good 2018 I see. Thank you Stefan! My account is 2 years old in April. This is great news, thanks for sharing! Congratulations! Hope it's the first of many more to come! Nice Grace. Thanks for sharing. Well done. Way to go, Grace! That's awesome! Well, got to get ready! use my site for reflection: rovingretirees.org! Way to go!! You inspire me!! Congratulations, Grace! That is another great stream of income to have. Sound great Grace:) Up to more successful sales! love this good news. Cheers! Wow, this is amazing!! Congrats =) Could you share some Instagram tips? Thank you Miren, sure I can I will PM you. 106k Instagram followers! - You're a true Instagram Influencer. With that kind of following you should be able to get more sponsorship deals like that, and ones that probably pay heaps more too. Congratulations! You are doing an awesome job...keep it up!! Congrats on the sponsorship and the sale. Hey Grace, congrats AGAIN. You rock! I love Disney & Mickey Mouse!!! Congrats Grace, your bussiness ideas never sieze to amaze me.. keep moving forward and encouraging us. That is awesome! I was just debating doing a review on a product I am not really happy with. This helps to decide to do that. Congrats on your success, may it continue tenfold! WOW! You are really on fire. Congratulations, and keep on going. Thank you very much Delores. :) I do, I will keep working hard! That's AWESOME Grace! So Happy for you!!!! All your hard work is paying off, Keep up the great work and I wish you even greater success going forward every day! Grace, Wow! It's time for another Celebration!!! I shall break out the champagne! You go little mama! You got it my dear! Lets keep it forward and positive! We're celebrating with you, congratulations! Way to go! Marching on!!! Thanks Ronnie, did I beat your March 1 income? LOL. Probably not! What a great start to your month!! Congratulations - and hope it continues like this for you. You deserve it! Yes the fans are crazy and has high engagement! Yeah I have Mickey Mouse on my Apple Watch and i used to go to Disney world as a child. Maybe I’ll do Disney and royal Caribbean cruises . How did you build your webpage? You mean how did I build my Instagram page? It's not a webpage. I just curate content from other IG users and I tag them in the photo to give them credit plus I also give them second credit in my caption. Thank you and glad I can remind you! :) It's definitely important. Awesome Grace, and the month has only just started keep on charging. Thanks so much Alex, I hope March will be an amazing one! That's fantastic! I hope your month continues like this! Great Job Grace! Keep on keeping on!! Thank you Denis! I sure will. Lol, that's great Zarina.. it's definitely exciting when you can build your business to a point like this! You can definitely do this too girl! You are so right, be honest in your praise of a site or lack of praise and it will come back to reward you! 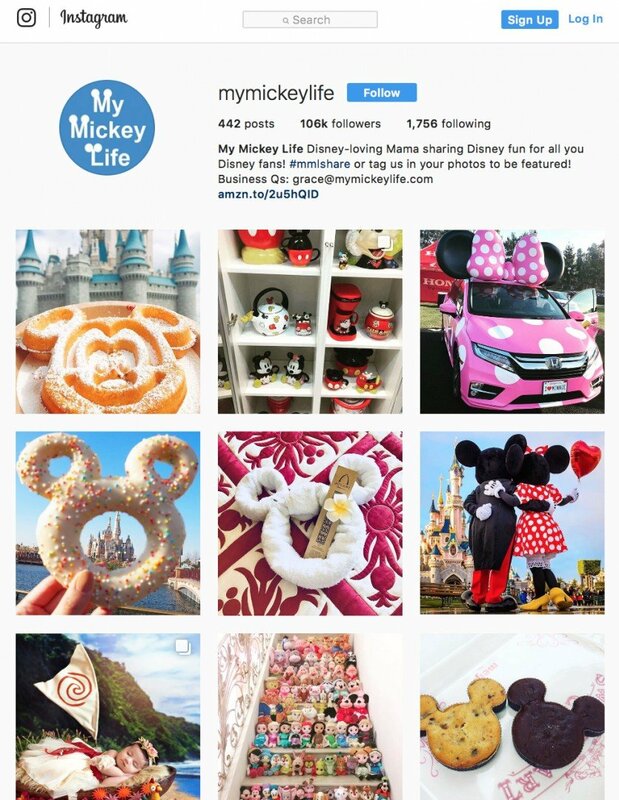 Hey Congrats on your MickeyLife and the rewards capped with your website Littlemama. Hmmm... marching on and marching on and on...TRA la..la. Yes! Looking for that Magical key Littlemama. Magic key = Hard consistent work. Way to go littlemama!!! Congratulations! Congratulations! Inspiration for a newbie! Thank you and so glad I can inspire! Check out my previous post about my Feb and 18 month progress: 18 Month & Feb '18 Update - Best Month Yet! Nice! People are interesting, aren't they? They'll buy even if you don't recommend it. You never know what people will purchase. Congrats on the payday! No no more using pics of members! LOL. thanks so much Wayne! Well done Grace! No stopping you now. Good for you and I like the fact that you are getting money from different sources. A very wise woman. Genius idea to have a Disney Instagram account. Who doesn’t love Disney. Yes gotta have different sources even on your website, I have tons of other programs I promote but the main of course is here but those other programs will still make significant money when my site increases in even more traffic. Wowee Grace, that's awesome!! Had such a giggle at the $45 you earned from a product you don't recommend. How cool is that? Super well done on the 108k followers on Instagram and sponsorship deal! Now i want to go to Disneyland!! !